JECHEON, North Chungcheong – Deep in the rural center of the country is a place where you can test your bravery high in the air. The Jecheon Disaster Training Center attracts families and groups of coworkers who want to experience quasi-military training. Attached to safety harnesses, participants ascend to the top of a three-story structure called the Marine Tower made of wood and cable. From there, there are eight different obstacle courses to follow, which involve walking on thin wires and other challenging movements. All of these activities start out 12 meters (39 feet) off the ground. Completing just one of the wood-and-cable courses takes a good hour for most participants. Instructors at the center said that some take up to three hours to complete the challenge while more experienced participants can finish within 15 minutes. For this reporter, that first step out onto a shaky wooden plank was the scariest thing in memory, but after awhile you begin to get used to it and start to move a little more quickly, especially as you descend from the third level down to the second. For this main challenge structure at the Jecheon Disaster Training Center, it costs 20,000 won ($17) per person to participate. On a nearby hillside, the training center offers a fun paint ball experience. Although the activity is popular in some Western countries, it is less common in Korea and there aren’t many paint ball venues. Should you wish to participate, you first change into a military-style uniform provided by the center to shield your clothing from the paint, and then don a safety helmet to protect your head and eyes. Although the paint ball pellets are as small as your fingertip, the impact can be painful. Thus you are advised to shoot the members of the opposing team from the neck down only. 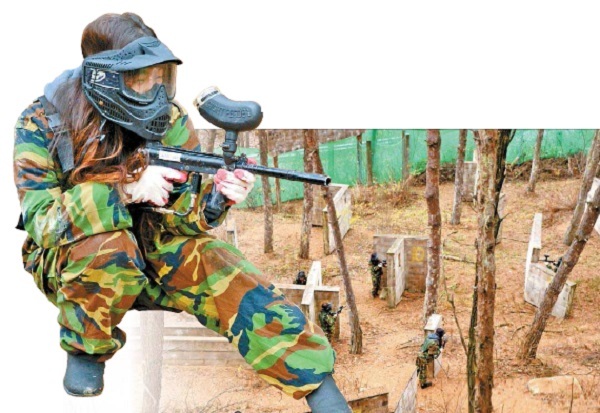 The paint ball survival game costs 30,000 won person for an hour of play. 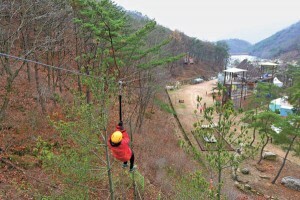 The center also offers zipline rides, climbing walls and other adventure activities. Packages that include several different activities together offer the best deal. For more information about the Jecheon Disaster Training Center, go to jecheon.alltheway.kr or call (043) 646-8785. The center is open from 9 a.m. to 5 p.m. on weekdays and to 6 p.m. on Saturdays, Sundays and holidays. From next year, the city of Jecheon will likely become a more popular destination for travelers, as the Korea Tourism Organization (KTO) has designated the city as “Year 2016’s Tour City,” along with two other cities. The designation is based on analysis that shows how much potential the city has to become a top travel destination, in line with the idea of stimulating the local economy. Jecheon will receive the KTO’s support to set up necessary tour infrastructure over the next three years. Jecheon will be one of the first cities to receive such benefits as the KTO launches the program for the first time next year. The tour organization will first help out with producing a promotional video and then further move onto establishing new travel routes and educating locals on how to better welcome visitors. Being a relatively small city with an entire population around 137,000 as of last year, according to government data, Jecheon will now try to attract bigger crowds by implementing a system of providing tour information in many different languages. And the city will hold more festivals to draw in visitors each season. 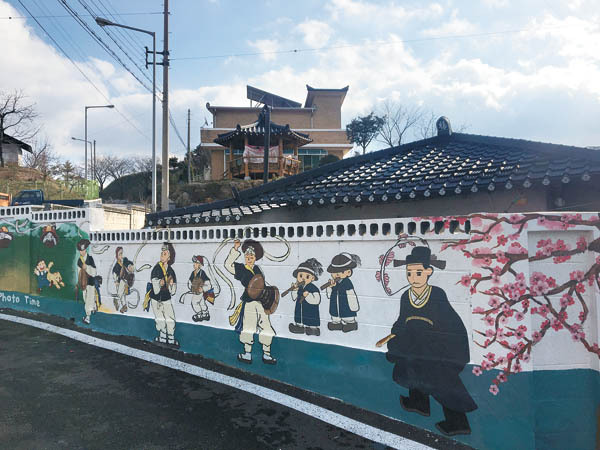 Besides the adventure training center, a popular place to visit in Jecheon is Gyo-dong, where the walls of every house are painted with characters found in minhwa, which is a type of traditional Korean folk art. 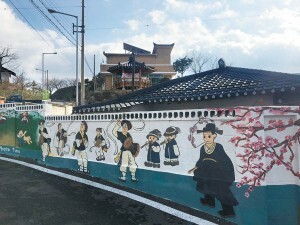 The walls feature tigers, flowers, writing brushes and other motifs frequently depicted in this traditional art form, making this district unique among many other villages across the country that feature such painted walls. You can pose as if you are taking a yeouiju, or magical orb, from a dragon, to wish for success in your work or studies, and pose as if you’re catching the shoe of a beautiful woman wearing hanbok (traditional Korean clothing) and sitting on a swing to wish for romance. After exhausting all your energy climbing ropes and wandering through alleys, head downtown to fill up on the city’s famous red odeng (fish cake). Local vendors dip odeng skewers in a red soup that is usually used for making ddeokbokki (spicy rice cakes). They also add a sweeter and stickier spicy sauce before serving the odeng, to add the unique flavor that makes this local dish so popular. One might say its like a combination of odeng and ddeokbokki, but because of the added sweeter sauce, the flavor is a little different. Many of the eateries that sell this type of odeng usually call it bbalgan odeng, which literally means red odeng. You can get four skewers for 1,000 won at most places, or one skewer for 200 won at others. Another popular dish in Jecheon is baby back pork ribs boiled in spicy sauce with mushrooms. It comes in a brass bowl and it is usually ordered along with rice mixed with vegetables in order to soak up all the sauce. The dish may not be unique to Jecheon, but when the city government conducted research to find out what foods were the most popular among visitors to the town, the answer it found was this meat dish. A single-person serving of ribs costs 10,000 won and vegetable rice costs 4,000 won. To get to Jecheon, go to Seoul Express Bus Terminal and take a bus to the city. The trip takes about two hours. Trains are also available to Jecheon from Cheongnyangni Station. For more information about where to go in Jecheon, call (043) 641-5114 or go to tour.okjc.net. The website is currently available in Korean only.